Shower the pain away with Dr. D’s Headache Relief Shampoo®. Headaches are the worst; Allergy, Arthritis, Caffeine-Withdrawal, Chronic Daily, Cluster, Depression, Eyestrain, Exertion, Fever, Hangover, Hunger, Hypertension, Menstrual, Migraine with/without aura, Post-Traumatic, Sinus, Temporomandibular Joint, or Tension headaches. With so many varieties, curing and relieving pain can be difficult for doctors and healthcare professionals. Luckily, there are broad spectrum products that have an effect on even the worst headaches out there. 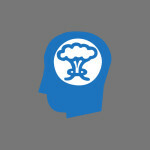 We are proud to introduce Dr.D’s Headache Relief Shampoo to help the war against headache pain. 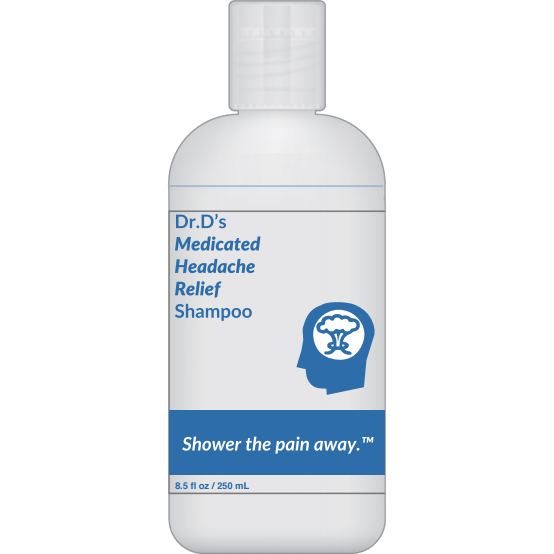 Who can use Dr.D’s Headache Relief Shampoo? Dr.D’s Headache Relief Shampoo is great for anyone suffering from headaches. Whether you get consistent headaches, seasonal headaches, sinus headaches, stress headaches, migraine headaches, or any type of headache. Dr.D’s is the solution without pills. Dr.D’s is safe to use on children ages 9+ and should be administered with adult supervision. Consult a medical professional if you have concerns about using over the counter topical pain relief. Does Dr.D’s Headache Relief Shampoo work better on specific headaches? Dr.D’s Headache Relief Shampoo is great for all types of headaches. Dr.D’s can help remove that dull after effect experienced when a headache begins to wane, and cut the initial pain of an oncoming headache. If you are experiencing pain so severe that it inhibits your daily activity, contact a medical professional to properly address the issue. Dr.D’s is an effective headache pain reliever but does not solve underlying medical issues. Underlying medical issues should always be addressed by trained, medical professionals. Why would I use Dr.D’s Headache Relief Shampoo over a bottle of pills? Some people experience nausea during headaches and it makes it difficult to ingest any pain relievers orally. Other people would just prefer an alternate solution to pills. The problem with consistent pill regimes is that they will slowly degrade the liver, all the while the body develops a tolerance to the medication. This can lead to a cycle where the medication needs to be changed constantly to keep up with tolerance. At Dr.D’s, we want to stop this medication feedback loop by allowing sufferers of headaches to avoid the pill bottles for their headache relief. When is it best to use Dr.D’s Headache Relief Shampoo? 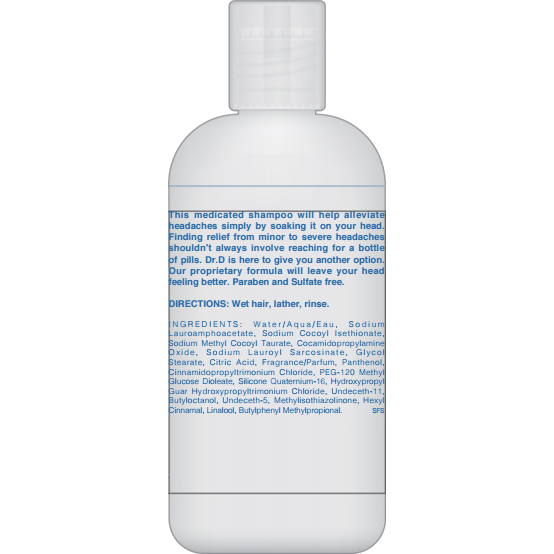 Dr.D’s Headache Relief Shampoo is best used after/during/before a headache because the benefits of Headache Relief Shampoo can have an effect during any of these times. That means, you can use Dr.D’s anytime you feel a headache coming on. A little goes a long way and there is more than enough medication in each bottle to last a long time. The best way to find out when to use Dr.D’s is to try it out. Every person is different and everybody reacts differently to different pain relievers. Where can I purchase Dr.D’s Headache Relief Shampoo? Currently, Dr.D’s can only be purchased online through our web stores. We will keep you posted when Dr.D’s will be available near you. If you are a store owner looking to purchase bulk amounts of Dr.D’s, please use our contact form to get in contact with our customer service professionals. If you suffer from – Allergy, Arthritis, Caffeine-Withdrawal, Chronic Daily, Cluster, Depression, Eyestrain, Exertion, Fever, Hangover, Hunger, Hypertension, Menstrual, Migraine with/without aura, Post-Traumatic, Sinus, Temporomandibular Joint, or Tension headaches, consider taking a shower with Dr.D’s Headache Relief Shampoo® to temporarily relieve headache pain. Dr.D’s will help relieve the pain of your headache without the use of pills, saving your liver for years to come. Shower the pain away. I was lucky enough to get a free sample from Dr.D himself. I waited until I had a headache and used the shampoo. It worked and I have even started to use it when I don’t have a headache. Thanks Dr.D! Wow, this actually makes my head feel good! It’s almost like using peppermint soap and getting out of hot shower when the air has a cool sensation…but this cool sensation lasts much longer! Simply put, this is awesome headache relief shampoo.